Kei Nishikori is a professional tennis player who is of Japanese descent. He is considered to be the best tennis player to come out of Asia in recent years and the reason is not farfetched. He has won 11 singles title and has reached the US Open final, becoming the first ever Asian man to reach the final of a Grand Slam. Get to know more about this future tennis legend here including his net worth, parents, siblings, wife, girlfriend, etc. Kei Nishikori was born on the 29th of December 1989 in Matsue, Shimane Prefecture, Japan. He started playing tennis as early as the age of five and won a Japanese tennis tournament for kids at the age of 11. After graduating from high school at the age of 13, Nishikori moved to the US to pursue his dreams of becoming a professional tennis player. He was part of a group of talented young Japanese players sponsored by Mr. Morita, CEO of Sony to train at the IMG Academy in Florida. The IMG Academy features one of the world’s most competitive programs for grooming young tennis players and has produced stars such as Andréa Agassi and Maria Sharapova. Nishikori began training in earnest and by the age of 17, he won the ITF Futures singles title in Mexico. He turned professional in 2007 and broke into the Top 100 in 2008 at the age of 18, also winning the ATP Newcomer of the Year that same year. Till date, Kei Nishikori has taken part in a total of 548 career matches, out of which he has won a staggering 374. He has won 11 singles title including the Delray Beach Open (2008), Japanese Open (2012 and 2014), Malaysian Open (2014), Citi Open (2015), Barcelona Open (2014 and 2015), Memphis Open (2013, 2014, 2015 and 2016). With regard to the Grand Slams, Kei Nishikori has not performed shabbily at all. He has made it to at least the quarterfinals of all the Grand Slams, becoming the first Asian player to achieve such a feat. Nishikori’s best performance at a Grand Slam till date has certainly been the 2014 US Open where he reached the final. In the semi-final, he defeated then world number one and tournament favorite, Novak Djokovic in four sets – 6-4, 1-6, 7-6, 6-3. He thereafter marched to the final where he lost to Marin Cilic in three straight sets. But despite the loss, Nishikori had already done enough and finished the year ranked as number 5 on the ATP male singles ranking. He became the highest-ranked Asian in ATP World Tour history and also the first Asian male to reach the final of a Grand Slam tournament. Kei Nishikori has also done well at the national level. He has represented Japan in the Davis Cup and also won a bronze medal for Japan in the 2016 Olympics in Rio de Janeiro. Net Worth – How Rich is Kei Nishikori? Kei Nishikori is reportedly worth a cool $9 million. His sources of income include his earnings from the various tournaments he has participated in. He has earned at least $20 million ($20,211,966) in prize money so far. Also, Nishikori is one of the most commercially viable athletes in the world. He has endorsements with several Japanese and international companies including Asahi, NTT, Japan Airlines, Lixil and Nissin (noodle company), Uniqlo, Wilson, Nike, Procter & Gamble, Jaguar, and Tag Heuer. Kei Nishikori is reportedly dating Honami Tsuboi, a former gymnast who represented Japan at the 2008 Beijing Olympics. Honami retired from gymnastics in 2010 and is now a certified yoga instructor. She regularly appears at her man’s tennis events and is often seen courtside supporting him. Kei Nishikori comes from a family of four. His father, Kiyoshi, is an engineer, and his mother, Eri, is a piano teacher. He also has an older sister named Reina, who works in Tokyo. 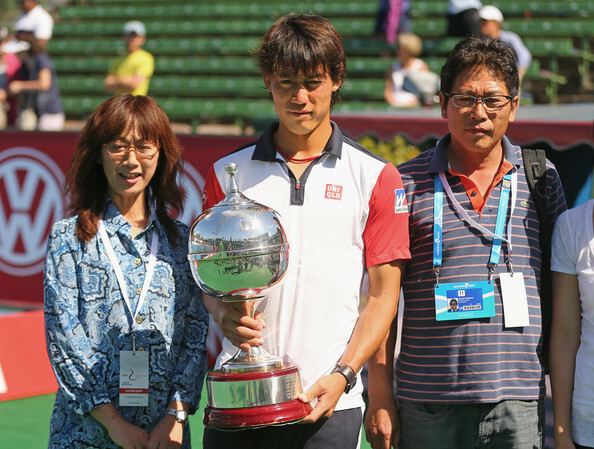 Nishikori’s parents played a pivotal role in him becoming a successful tennis player. First and foremost, he fell in love with tennis at the age of five after his dad bought him a children’s racket on his way back from a business trip to Hawaii. He started hitting balls against the wall with ease and as such his parents decide to enroll him in a local tennis school. Secondly, his parents recognized that he had to move abroad to succeed and were supportive of his decision to move to the USA at a young age so as to actualize his dream of becoming a tennis player. Kei Nishikori has a modest stature. He is 5 feet 11 inches tall and weighs 170 lb or 77 kg. By professional tennis standards, he is short but he makes up for it with his aggressive game which features a leaping forehand that is uncommon amongst Asian players. Nishikori is currently being coached by a former professional tennis player, Michael Chang. Chang is an American of Chinese descent and is the youngest man to win a Grand Slam. He achieved this feat in the 1989 French Open at the age of 17 years and four months.